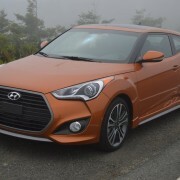 Hyundai originally introduced the 3-door Veloster sports coupe with a rather anemic 132hp four cylinder engine that peaked at just 120 lb.-ft. of torque. Even with that handicap, the original version was a lot of fun to drive because of the car’s sporty design and ingenious packaging. 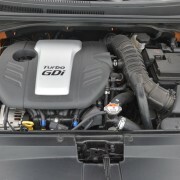 Its pin point steering accuracy, racy seating position, and responsive manual transmission all coalesced into a spry and energetic combination that cried out for more horsepower. 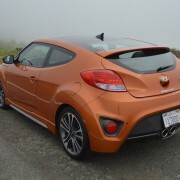 Unlike Toyota/Subaru – who have refused to turbocharge their sluggish 86/BRZ – Hyundai responded to the Veloster’s crying need by introducing a twin scroll Turbo version. 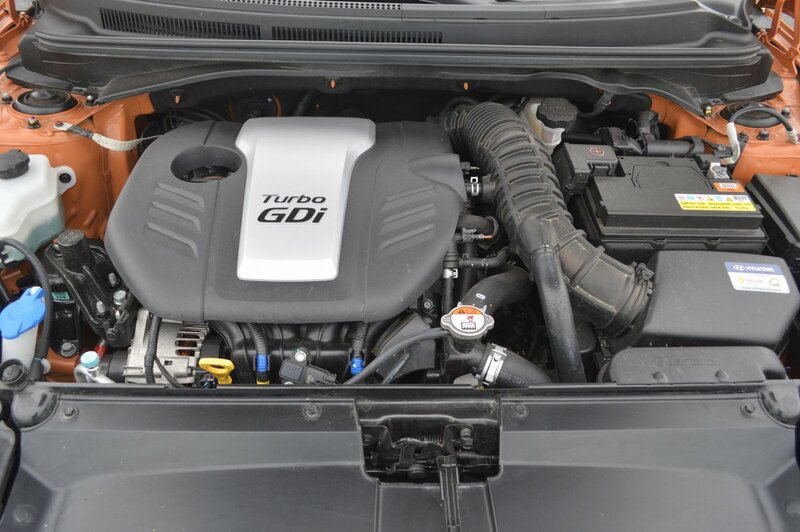 This stunningly quick 201 hp upgrade of the base motor is also good for 195 lb.-ft. of torque. 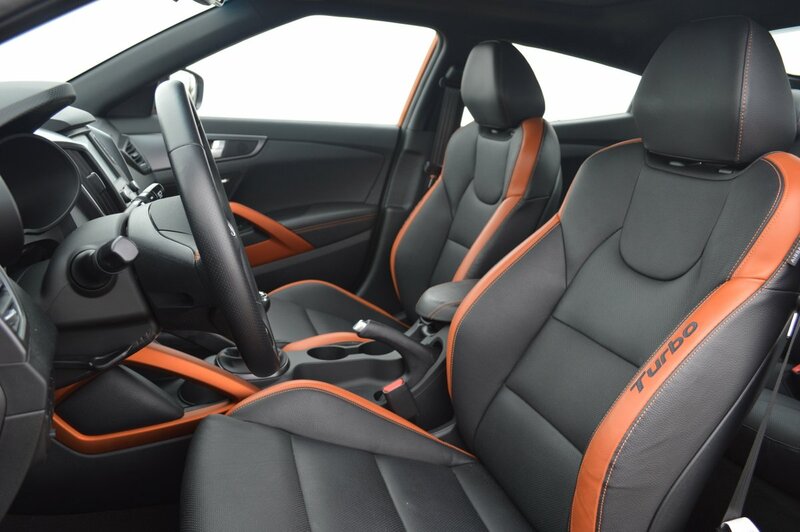 Coupled to a slick shifting 6-speed manual gearbox, the Turbo transforms the Veloster into a genuine sports car. 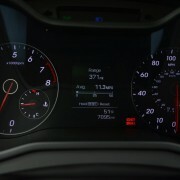 Its excellent acceleration and handling will match cars costing twice as much. 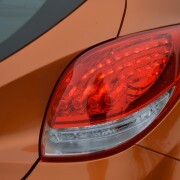 Hyundai’s racy intentions are evident the second you lay eyes on its curvaceous lines. 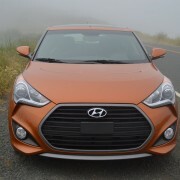 At the front, company stylists have borrowed heavily from Audi design language with an elliptical six sided grill opening that makes the Veloster look predatory. 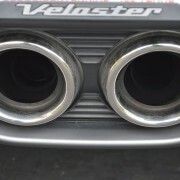 Muscular bulging flares front and rear endow the lightweight (2,765 lb.) coupe with a muscular stance that will instantly attract fans of the Fast and Furious. 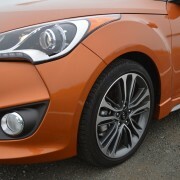 Under those flares lie diamond faced multi spoke alloy rims that offer intriguing design complexity. 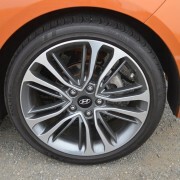 Each wheel plants a mildly sticky low profile Kumho Solus radial tire (225/40R18) on the pavement. 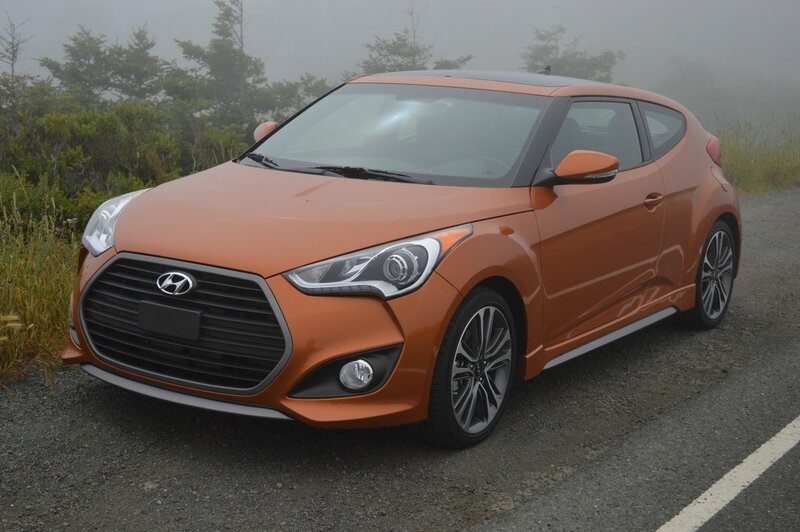 With its low slung stance, stiff springs, and excellent torque vectoring control system, the Veloster is capable of exceeding the grip of its Kumho tires, which issue audible chirps as they reach their adhesion limit. Inside the cockpit, you’ll think you’ve been transported to the flight deck of a fighter jet. 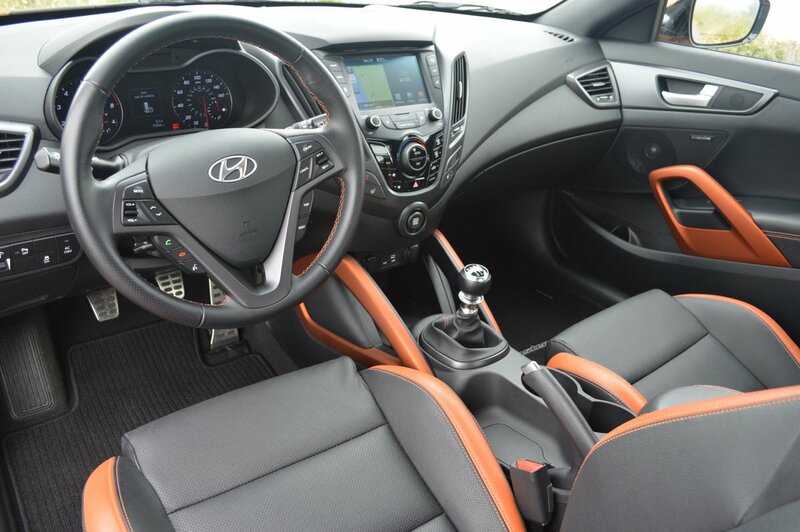 Our Veloster sported a stunning exterior shade called Vitamin C, an opalescent orange that is carried right through to the interior. When climbing aboard, the first item you notice are oversized, door mounted grab handles, painted to match the exterior finish. 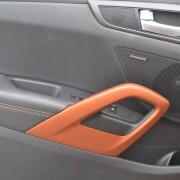 But instead of using gloss paint like the exterior, these handles are done in a grippy matte paint that makes them easy to grasp. 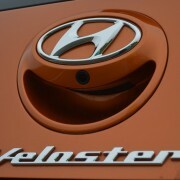 This little touch reflects Hyundai’s exacting attention to detail. 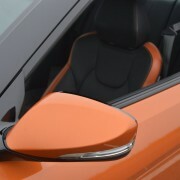 Once seated, you appreciate that the deeply bucketed front sport seats feature side panels upholstered in Vitamin C to match the exterior. 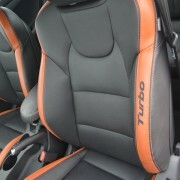 Finally, you notice the prominent “Turbo” notation embroidered in black on the driver’s outer orange seat bolster. The net effect here is entrancing, like a show car that somehow escaped its rotating display pavilion and actually ended up for sale. And how much outlay is required for this show winning display piece? 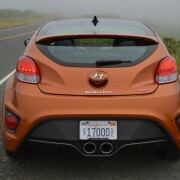 If the Veloster had a German nameplate attached, it would easily retail for $40-60,000. 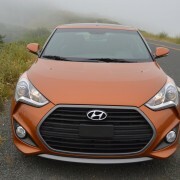 Because it’s made in Ulsan, Korea, however, the base price of the Veloster Turbo is $22,600. Our test car, with its optional $2,700 Tech Package (Panoramic Sunroof, Navigation System with 7″ Touchscreen) checked out at $26,260. Call it the deal of the 21st century. But there’s more on offer here than visual cortex stimulation. 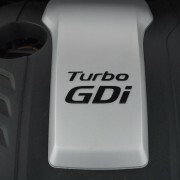 More than the excitement of charging through the gears and peaking the turbo at 6800 rpm with each upshift. 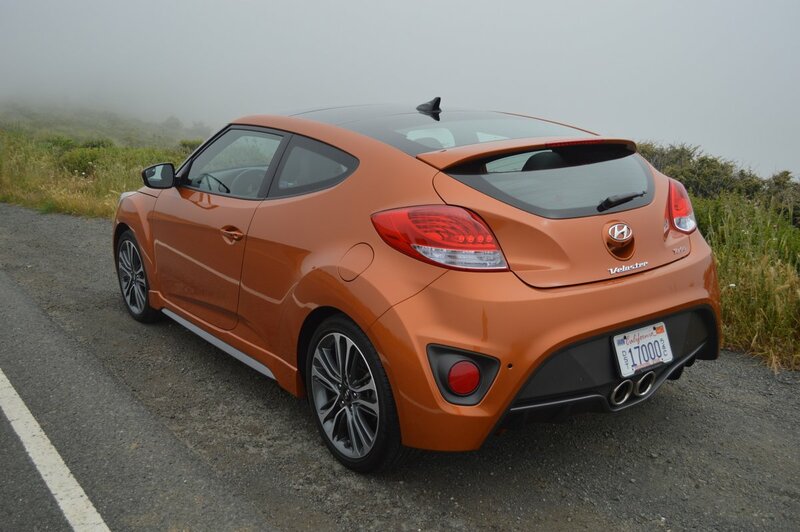 Because the Turbo Veloster is in many ways a remarkably practical package. 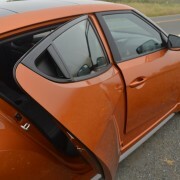 Start with that ever-so-useful third door, which is so inconspicuously incorporated on the passenger side that you wouldn’t know it existed by looking at the flush exterior surface. But it makes packing the kids in back ever so easy. You can even shepherd a couple of adults through this portal for short hops. And when you do some shopping, tossing the goods into the backseat is thankfully simplified by the expedient of this third door. 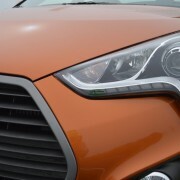 Then too there’s the fuel saving penchant of the Veloster’s efficient Turbo motor, which returns 25 MPG around town and 33 MPG on the highway, and 28 MPG overall. 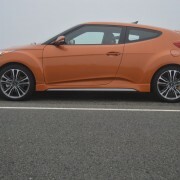 The base model, non-turbo Veloster only exceeds those numbers by 2 MPG. 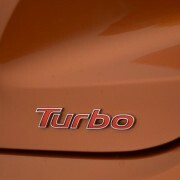 That’s hardly a savings worthy of foregoing the thrust of this affordable and enjoyable Veloster Turbo.